Down, Down, To Goblin Town J. R. R Tolkien. 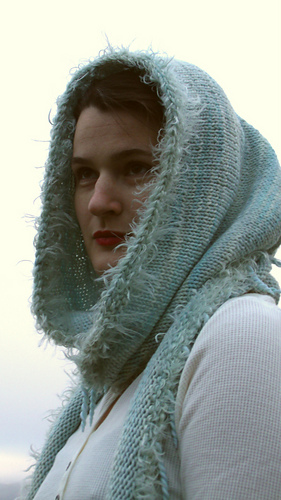 This is a quick weekend knit and a fun bead project. The beads are a good introduction to polymer clay. I had never used it before but, alas, could not find “just the right beads” when I was looking. 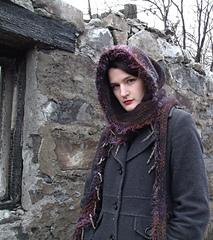 For a worsted weight yarn the length is about 10 feet long the hood is about 13 inches deep by 10 inches tall. For a sport weight yarn the length is about 8 feet long and the hood is about 11 inches deep by 8 inches tall. The hood is meant to be wide and deep but it is important to get gauge. 2 skeins (500 yards) of 4/8s rom Mountain Colors. Shown in Moose Creek and Harmony Ice, or 3 skeins (345 yards) River Wash Sport. 1 skein (85 yards) of Wooly Feathers from Mountain Colors. Shown in Moose Creek and Harmony Ice. 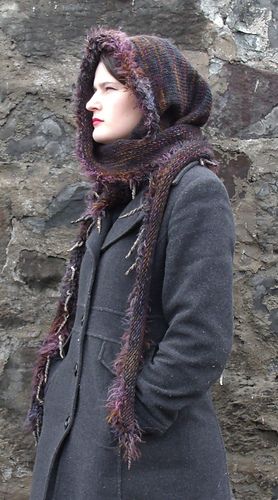 Worsted weight yarn: US size 10½ needle or size needed to obtain a gauge of 4 sts per inch. Sport weight yarn: US size 7 needles or size needed to obtain a gauge of 5 sts per inch. 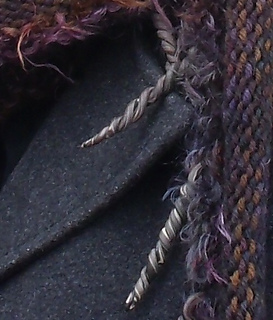 the spike beads. I have included a PDF for a tutorial on how to make the beads. Ellen at Earthfaire has put together some wonderful kits that include the exact yarns used and has special sets of polymer clay that include more than enough clay to make your beads and make them special. You can find the kits for the yarn and the sets of clay here.